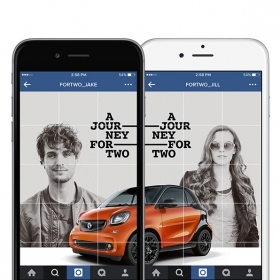 Smart USA’s latest pitch on Instagram for the new 2016 ForTwo is a tag-team effort. While much of the marketing content hitting the social sphere these days is designed for one person to absorb on a mobile device, Smart’s campaign is meant for two -- just like its miniature cruiser. Putting a unique spin on storytelling, the automaker started two Instagram accounts — @fortwo_jill and @fortwo_jake — that each tells half of a story. The tale comes together when two users place their mobile devices side-by-side while looking at the accounts. When people scroll through the accounts together, they’ll get a look at the ForTwo’s interior features and exterior while learning about the minicar’s turning radius and storage capacity. In November, Smart posted a teaser video on its Instagram, Facebook and Twitter accounts upon the campaign’s launch to give users a rundown of how it works. The Instagram effort tells the story from the millennial perspective, but Aikman says the campaign targets a mindset rather than a specific consumer group. The environmentally conscious demographic is an obvious one, but Aikman says Smart also wants to reach those living in urban and suburban areas who may be attracted to the ForTwo because it’s easy to park in cramped environments while still providing ample storage space. In addition to the Instagram campaign, Smart marked the launch of the 2016 ForTwo with a 10-city tour that kicked off in September in Brooklyn. The tour, highlighted by test drives, graffiti art and wildly colorful ForTwos, ends on Sunday in Miami. The brand also redesigned its website for the launch and put together a video brochure that shows the car in action. Aikman said Smart’s Instagram campaign comes at a time when people are receptive to shared user experiences. The idea of technology pulling people together, he says, will continue to express itself in social media as well as in other areas such as gaming and file sharing. 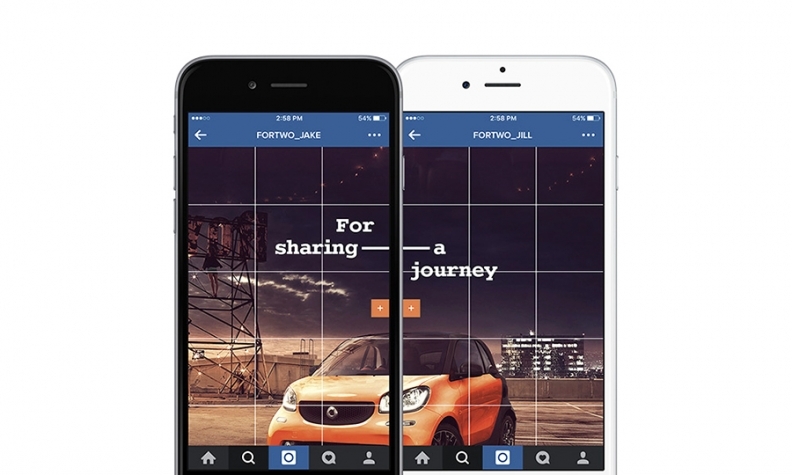 Smart collaborated with digital agency Razorfish for the Instagram campaign.